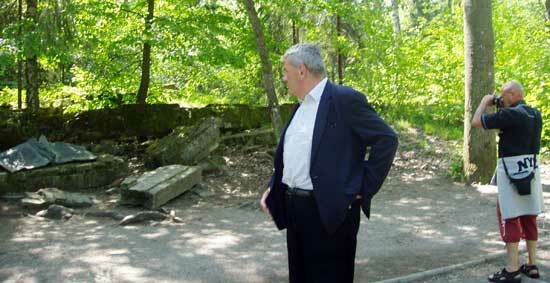 Photo: In May 2007 David Irving visited the site of Hitler's famous headquarters in East Prussia, Rastenburg ("The Wolf's Lair"), and inspected the ruins of the hut where Stauffenberg planted his bomb before making good his escape (above). I'M CURRENTLY studying A-level history and am beginning to write my coursework on the July Bomb Plot against Adolf Hitler. In attempt to gain evidence and sources and also allow myself an unbiased and fair view of the events I was wondering if you have written any literature on the matter or if perhaps you have a personal opinion or view on it that I could use to aid my coursework as I feel your opinion would be of great help. 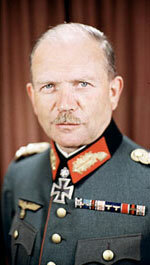 YOU will find a great deal of material on the Plot in my Hitler biography; you can download it free and if you are really keen I could send you the draft pages from my forthcoming Himmler biography as Word files. I expect you are rather overwhelmed with stuff. The real expert on the Hitler Plot is Professor Peter Hoffmann in Montreal University, and you would do well to wheedle a short quote from him. 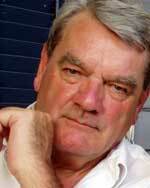 He wrote the book, literally, on the anti Hitler conspiracy and on Count Stauffenberg, the assassin. Mention my name, and I am sure he will write you. In my mind the really interesting question is which other top Nazis were "in the know" and stood back, waiting to see which way the cookie crumbled: Heinz Guderian (right: he however became Chief of General Staff a few days later and kept his mouth shut), Joseph Goebbels, Albert Speer, Heinrich Himmler himself -- there are clues that each of these men knew the balloon was about to go up that afternoon, and panicked when it went wrong.